Turning the big 4-0 with nothing in the bank for retirement isn’t ideal but it’s reality for a lot of Americans today. The Employee Benefits Research Institute reports that 37% of all employees age 35–44 and 34% of employees age 45–54 have less than $1,000 saved for retirement. If you fall into this camp, take comfort in knowing you’re not alone. But realize you have a big hill to climb if you want to build a decent-size retirement nest egg. You missed the opportunity to let time perform its compounding magic on your investments and now you’re faced with a simple math problem: The compounding approach won’t work for you if you start this late in the game. It’s tough to accept, but it’s true. 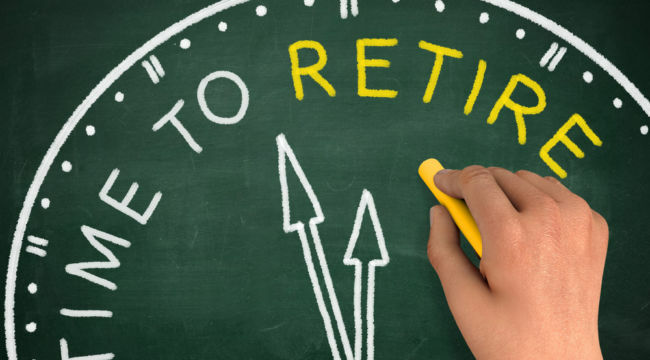 There are a variety of reasons why you left retirement planning until your forties. Dealing with too many debt commitments, juggling other priorities, having too little time, or simply not realizing that your 60s are closer than you think. Here’s how to find these numbers: While a lot of people see 65 as the “normal” retirement age, it’s by no means definitive. Take into account your age, salary, expenses and how long you’re likely to live, and you can figure out what age is a realistic retirement target. Also consider all possible retirement income streams you might have. Will you have a pension, or will you depend on Social Security? To calculate your Social Security payments, enter your birthdate and current salary into this Social Security calculator from the U.S. Department of Labor. You’ll see how retiring a year or two earlier or later will affect your monthly payments. For example, a 40-year-old earning $50,000 a year can expect benefits of $1,566 per month if he retires at age 65, or $1,824 if he waits until age 67. After you figure out what age you plan on retiring, run your numbers through AARP’s Retirement Calculator. Enter your age, salary and lifestyle details, and the calculator will build a graph that shows your estimated retirement income and projected living expenses, as well as any gap between the two. Adjusting your planned retirement age helps show you how working an additional year or two could affect your savings. What you might find is even delaying retirement until age 67 or 70, doesn’t close the gap entirely. This is where you need to rely on savings. So, how much money should you be saving? To get a quick answer, use this Retirement Savings Calculator. Add your age, salary and current savings and the calculator will spit out how much of your annual income you should be saving for retirement. This will be like a splash of cold water to your face. A 40-year-old earning $60,000 should aim to save 17 percent of his annual income — and that’s assuming he already has $10,000 in the bank. If you’re not sure where this money is going to come from, move on to step two. In your 40s, you should be earning substantially more than you did in the earlier stages of your career. The downside is you probably feel comfortable taking on bigger expenses now. If you want to bridge the gap between your estimated retirement income and living expenses, you need to start slashing your living costs to free up cash. Build a budget and see where the bulk of your money is going each month. Figure out which major expenses you need to cut. Scaling back your cable package might add another $50 a month to your savings, and so might packing a lunch two or three times a week. But if you have virtually nothing saved in your 40s, it’s going to take more than $50 a month to make up for two decades of neglecting your nest egg. Decide that instead of holding onto two vehicles, you and your partner will share one. Or, consider downsizing to a smaller home or condo which will lower almost all your housing costs in one shot. Working harder after you’ve spent the last 20 years or so paying your dues is not appealing, I know. However, if you’re willing to take on a second, part-time job, you could reach your retirement savings goals a lot faster or without having to take such drastic measures as mentioned above. For instance, if you can make an extra $400 a month on top of your regular paycheck, you might not need to become a one-car family. Better yet, if you’re able to reduce some major expenses and work a side job, you’ll accelerate your savings and not only hit retirement on time but have a sizeable nest egg to boot. After you’ve made all the necessary calculations, trimmed some major expenses, and found a few new opportunities to earn some extra cash on top of your regular paycheck, run the numbers again. Go back to AARP’s Retirement Calculator and see if you’ve closed the gap between your estimated retirement income and projected living expenses. If there’s still a gap, go through steps 2-4 again and figure out how you can move the needle in the right direction. At the end of the day, you’ll have to work with what you have. You might realize that given your skillset or current time commitments, working a second job is not feasible. Or, you’ve cut your expenses to the bare bones and the numbers still don’t add up. Once you’ve reached this point, then it’s time to consider higher risk investments to give your money a shot at growing. Treat high-risk portfolios as a last resort.